MASH & NCHRP 350 – RSI - Road Systems, Inc.
MASH and NCHRP 350 represent uniform guidelines for conducting full-scale crash tests for permanent and temporary highway safety features along with recommended evaluation criteria to access the test results. Products addressed in MASH and NCHRP 350 include longitudinal barriers, transitions, end terminals, crash cushions, breakaway/yielding supports, truck mounted attenuators and work zone traffic control devices. The crash performance is judged on structural adequacy, occupant risk and vehicle trajectory. The in-service evaluations of these devices are also addressed in MASH and NCHRP 350. Note that NCHRP 350 has been rewritten under NCHRP Project 22-14(02). Click here for details. MASH has been adopted and was first published in 2009 and was updated in 2016. Click here for more information. 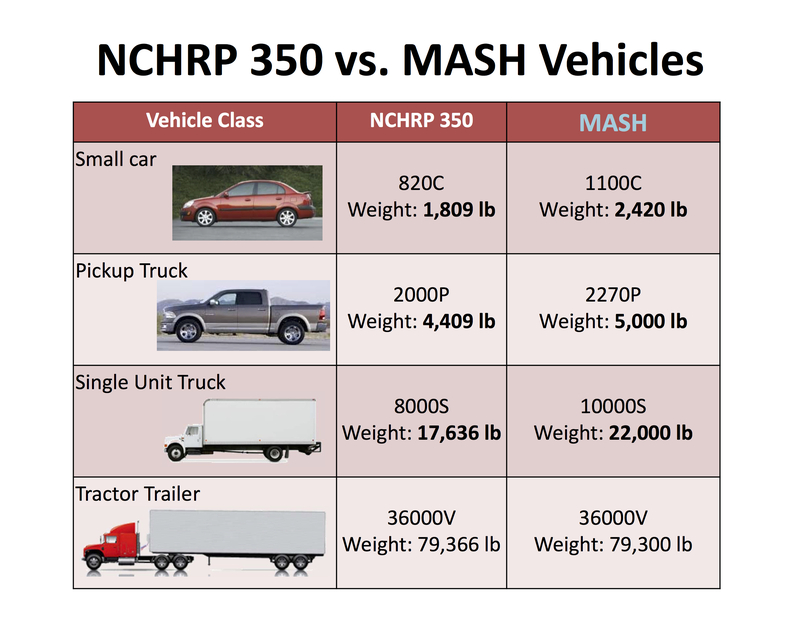 Click here to see a summary of the differences between MASH and NCHRP 350. The rewrite of NCHRP 350 is completed. 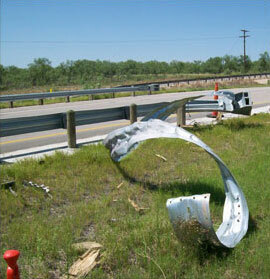 It was reviewed by the AASHTO Technical Committee on Roadside Safety (TCRS) and is an AASHTO document. It’s called The AASHTO Manual for Assessing Safety Hardware (MASH). This rewrite updated the test vehicles, the impact condition criteria, and the evaluation criteria. 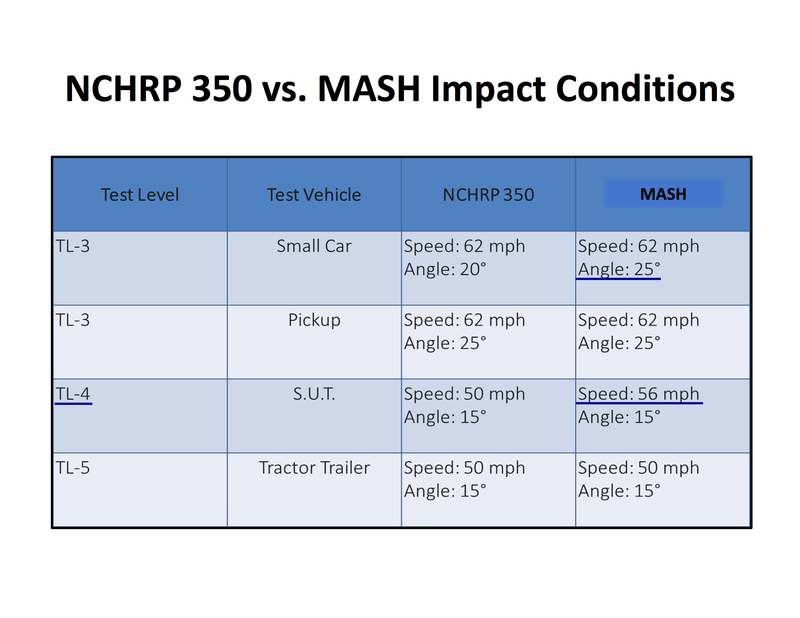 The differences between MASH and NCHRP 350 along with the AASHTO/FHWA joint implementation plan can be seen at the above link. Test Vehicles were updated to what’s being produced and sold today. Impact Condition Criteria were modified to correct inconsistencies and identify needed conditions. Evaluation Criteria were modified to correct subjective criteria and better define other criteria. Pickup truck increases from 4,400 lbs. to 5,000 lbs. Small car increases from 1,800 lbs. to 2,420 lbs. Small car impact angle changed from 20 to 25 degrees. Terminal & Crash Cushion impact angle changed from 20 to 25 degrees. TL-4 truck increases from 17,600 lbs. to 22,000 lbs. TL-4 truck speed changed from 80 km/hr to 90 km/hr. NCHRP #115 1971 70 4000 to 5000 lb. cars.